Inspiration can come from some pretty strange sources. Case in point: a new adhesive Band-Aid inspired by Pomphorhynchus laevis, a spiny-headed worm that lives in the intestines of fish. The parasitic worm pokes its tiny, spiny, cactus shaped head through the intestinal lining and then inflates its head with fluid to stay anchored. Using the same principle, the team at the Boston-based Brigham and Women’s Hospital created an adhesive patch with needles that swell up when they get wet, interlocking with the tissue. When this sticky patch is applied to anchor skin grafts that have just been placed over an area of injury or burn, it is three times stronger than surgical staples—and it causes less damage to soft tissues. Because it penetrates about one fourth the depth of staples, it should also be less painful to remove. Hmmm, doesn’t it make you wonder what creepy crawly will inspire the next medical technology? Cockroaches? Spiders? 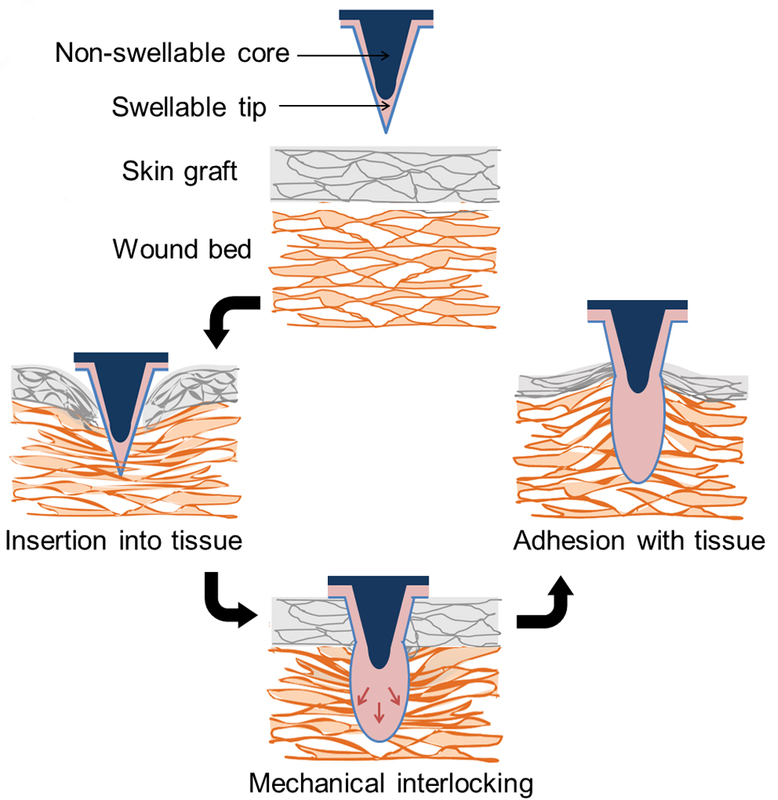 A bio-inspired swellable microneedle adhesive for mechanical interlocking with tissue. Yang SY, O’Cearbhaill ED, Sisk GC, Park KM, Cho WK, Villiger M, Bouma BE, Pomahac B, Karp JM. Nat Commun. 2013 Apr 16;4:1702. Gee,it is good to know this now at age 62. I am a parasitologist since I was 22 years old. Its really an interesting product. Who is the manufacturer of this product? When is this supposed to hit the market? It sounds interesting. Hopefully, it can turn out to be a painless medical application. My kids are kind of hairy, so taking off bandages used to be a howl-inducing operation. Now I dab some olive oil on the Band-Aid, give it a minute, and slide that baby right off.